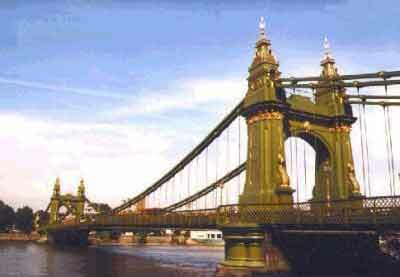 You're looking at the Hamersmith Bridge across the River Thames. This graceful, bridge across the Thames was designed by Sir Joseph Bazalgette and completed in 1887, replacing a previous bridge built in the 1820's. The bridge was built by public subscription and sufficent funds were collected for statues to be built under the bridge and ornate lights above it. It was strengthened in 1973 to 1976 but, retains it's original character.